Once you are logged in you will see a list of games you have registered. If you are a new user without any registered games you’ll see a full list of all games in our system. 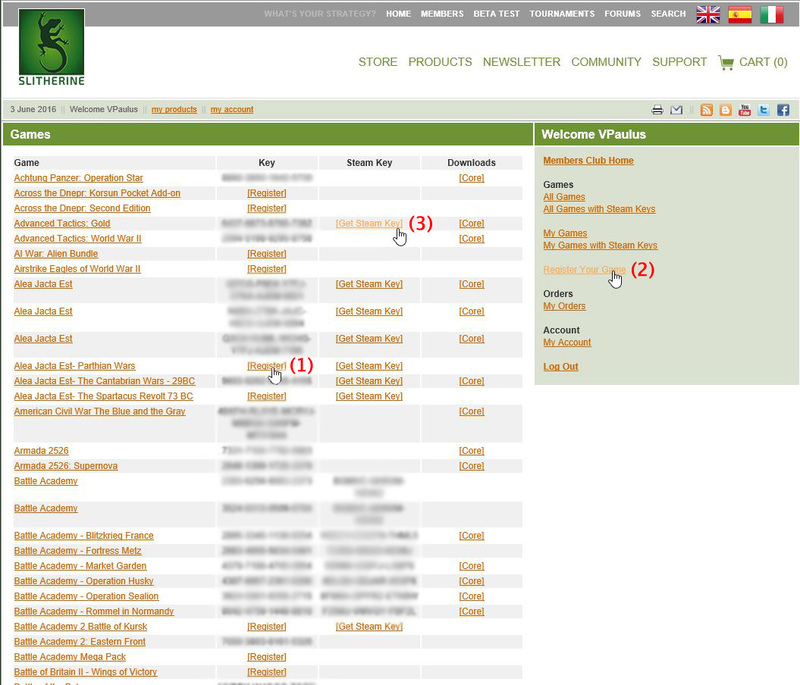 The menu on the right lets you navigate around, and register serials. Either browse to find the game you want to register and click the Register link (1), or select the Register button on the right (2) and follow the instructions to register your key. Once you have registered your serial you can select “Get Steam Key” (3) for any game which is available on Steam and this will redeem a Steam key. Now go to Steam. In the Steam client select “Game” from the top menu and “Activate a Product on Steam” and enter your key. I purchased all three US Corps and registered them before the recent site upgrade. At that time I had the option to redeem a Steam key for them but choose not to. Now after the site upgrade the option to redeem Steam key for them is not there. The games are available for purchase on Steam. What happened to ability to redeem Steam key for US Corps? Is this just a technical issue that will be resolved soon or has Slithering decided to not make Steam keys available for US Corps? Thank you. Love the Panzercorps series, keep up the good work! I'm sorry but as we are moving Slitherine to a new site we are experiencing some issues related with the move. Unfortunately that's one of them. We will fix this as soon as possible. Our apologies for all the inconvenience. I just bought Panzer Corps Allied Corps using the D-Day sale discount. When I tried to activate my steam key, it gave me a duplicate key error. Is this part of the moving the site problem, or something else? Should I send my problem to tech support or wait a day or two and try again? If I need to wait a couple of days for the move to sort itself out, that is no problem. I wasn't planning on playing the game immediately anyway. Thanks. JWW wrote: I just bought Panzer Corps Allied Corps using the D-Day sale discount. When I tried to activate my steam key, it gave me a duplicate key error. Is this part of the moving the site problem, or something else? Should I send my problem to tech support or wait a day or two and try again? If I need to wait a couple of days for the move to sort itself out, that is no problem. I wasn't planning on playing the game immediately anyway. Thanks. We believe it's related with the moving of the Slitherine site. If you have redeemed a Steam key then please contact us tech support. If you haven't, please don't redeem a Steam key until we fix the issue. Thanks for quick response and good news! I got the same problem. Looks like the steam keys generated for US Corps 44'-45' are actually for US Corps 42' or US Corps 43'. Exact same problem just happened here. I didn't check into it on this forum until after it happened. I'll check back to look for instructions to get around this. I got Steam key for US Corps.I put code for 42 and 43 and it worked.When and tried for 44 - 45 does not work.Could you guys help me? Thanks! The new steam key worked. My problem was solved promptly, too, with a new Steam key. Thanks. I purchased Panzer Corps Grand Campaign '39, '40 '41and '42. All but '39 will install on Steam. I get a duplicate key error when I try to install '39 on Steam. How do you fix that? Vonbrowns wrote: I purchased Panzer Corps Grand Campaign '39, '40 '41and '42. All but '39 will install on Steam. I get a duplicate key error when I try to install '39 on Steam. How do you fix that? We are looking into the issue. The US Corps issue should now be fixed. I have redeemed my Steam keys and activated them on Steam, but US Corps is not appearing in the game. All I have is Wehrmacht, Afrika Korps, Allied Corps, and Soviet Corps. Any suggestions? Yes. It's in the 'More Campaigns' menu, at the end of the list after the German Grand campaigns.